On Monday mornings the children all have to pick up the litter from around the school site. 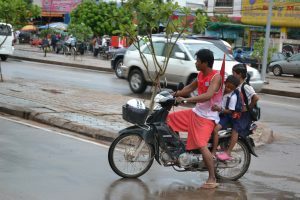 The two different groups – the morning and the afternoon groups – each do it twice a week, and it really needs doing because Cambodia seems to be covered in plastic. There are empty drinks bottles and old plastic bags everywhere, and there seems to be no recognition of the value of recycling and re-using. 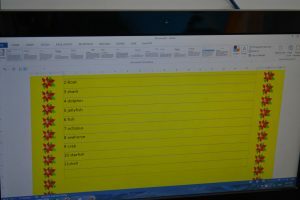 Then it was the favourite lesson of the week … computers! There is a room at the school with 17 HP20 computers, which a philanthropic Australian persuaded a company to donate to the school, and the children love them. 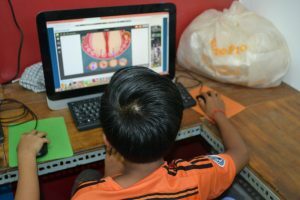 The families don’t have computers at home, and their government school, which they attend for the other half of each day, doesn’t either, so Grace House is very lucky to be able to give them this opportunity. We had to balance along a narrow strip of low wall to get to the computer room because the ground on either side of it was flooded. 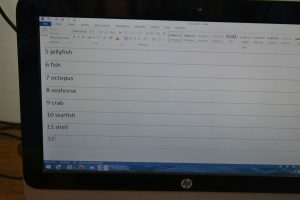 The first task was to type up the new words learnt last week. I was interested to see that even in this different culture the boys and the girls have the same approaches to presentation as they do in England. 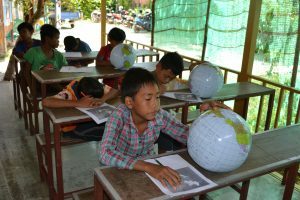 Then came my first geography lesson, on the topic of South-East Asia, and I used the inflatable globes donated by Matron in our school boarding house. They were very successful and helped me too, as I was none too sure of the exact location of Borneo, Taiwan and the Philippines … but I am now. 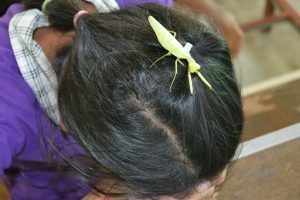 At the beginning of the afternoon class a girl walked in with the most enormous insect on her head, and nobody reacted at all, apart from me. I briefly wondered what it would taste like fried in butter, but decided to settle for a photo instead. It rained all afternoon, turning the school grounds into even more of a quagmire. 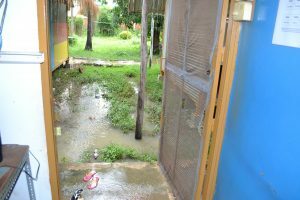 This is the view from the computer room – plastic shoes are essential here; they get left out in the rain several times a day. 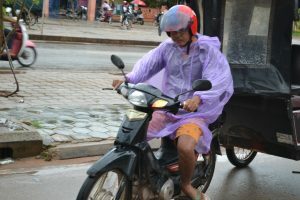 On the way home I was able to observe the various solutions the locals have come up with for travelling in the rain. 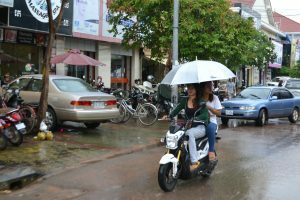 The rain is so warm that it really doesn’t matter if you get wet, although I’m hoping that trench foot is only a problem if you’re wearing army boots and not flip-flops.